EUROPE was caught by surprise today with the announcement that Angela Merkel– the EU’s strongest alien invasion puppet- was throwing in the towel as party leader of the CDU. The euro fell to session lows today as the news broke Angela Merkel would not be continuing her position as the leader of her party after 18 years. Angela Merkel has said she will stand down as German Chancellor when her current term comes to an end in 2021. Merkel, who has held the office since 2005, said her government had lost credibility after a bruising election result in Hesse at the weekend, which saw the CDU emerge victorious but drop almost 11 points at the polls. She will also quit as leader of the CDU, a post she has held since 2000, in the coming days, with a new leader due to be elected at party conference in December. ‘I will not be seeking any political post after my term ends,’ Merkel said, bringing an end to her career after more than a decade at the top of German politics.She added that she accepts ‘full responsibility’ for weakening party support, which comes in the wake of the migrant crisis. Merkel announced her decision alongside Volker Bouffier, the Prime Minister of Hesse, after a her CDU party took a beating at the polls in the state. 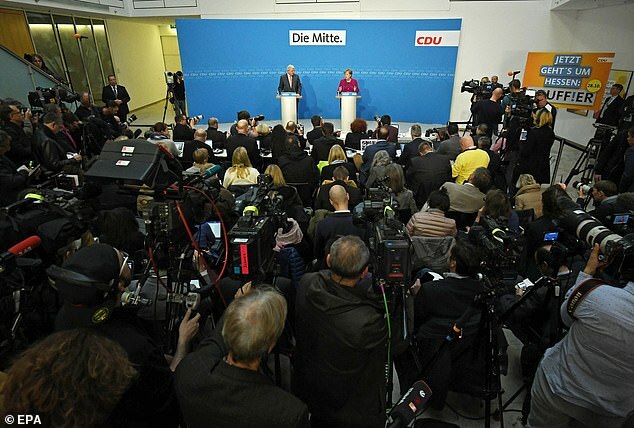 Merkel told a news conference that it is time to ‘turn a new page’ following a string of ballot-box setbacks that started with the general election in 2017, when the CDU hemorrhaged support to anti-migrant party AfD. Jews in the European Union were scurrying as the Euro fell to 0.88p against the Pound today as the news broke the German leader would not be standing as Chairwoman of the CDU. The currency headed for the lowest level in two months. It fell as much as 0.4 per cent to touch a day low of $1.136 against the dollar while German Bund yields rose one basis point to 0.36 per cent. The German Chancellor told leaders of her Christian Democrats (CDU) that she will not seek re-election as party chairwoman at a conference in early December, a senior party source said. Merkel, 64, has been CDU chairwoman since 2000 and giving up the role would start a race within the party to succeed her as chancellor. German news agency DPA, citing sources, tweeted that Merkel wanted to remain chancellor although this would be an unprecedented move. The news follows a catastrophic election in the German state of Hesse where the CDU suffered losses. Despite Merkel’s party remaining the largest in Hesse, Klaus-Peter Willsch, the CDU’s representative in the state, said the result was a demonstration of how no one was satisfied with the current federal government. “This is a true hint that it is not a state policy but a federal policy problem we are facing – everyone could see our government is not performing,” he told CNBC. As the German currency plunged, the German DAX soared as the markets sought to make the most of a plunging euro. The currency later erased some of the earlier losses as the news broke to trade down 0.1 percent at $1.1389, roughly where it stood before the report. The euro zone’s leading stock index rose 0.7 percent by 0941 GMT and Germany’s DAX gained 1.1 percent. Both indices benefit from a weaker euro helping exporters. German bond yields extended their rise, with the 10-year Bund yield last up almost 4 bps at 0.39 percent. Euro fell against the USD after the Angela Merkel news broke “The party of the Federal Chancellor, although the strongest party, has suffered historic losses, and there has been another debacle for the Social Democrats. Both parties have opened Pandora’s box. Their leaders will have a hard time keeping alive a government that is bleeding to death. “The election results in Hesse join those in Bavaria two weeks ago. The scenario is worrisome for all of Europe, because the continent’s locomotive is on the brink of political uncertainty.” The reprecussions of her decision are likely to resonate far and wide, not least in the UK, where Brexit is the topic of the day. Merkel has been known to tip the scales in terms of Brexit as she has a more conciliatory approach that France’s Macron.